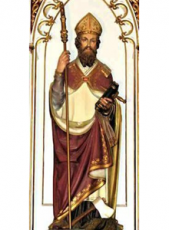 Saint Boniface was a missionary who propagated Christianity during the 8th century. He was killed in 755 along with 52 others. Facts about Boniface’s life and death as well as his work became widely know, since there is a wealth of material available, a number of his writings, legal documents, some sermons, and above all his correspondence. Boniface is recognized for his work in being one of the outstanding “Creators” of Europe, and as the apostle of Germany. He is also remembered for his help to shape Western Christianity, and many of the Dioceses he proposed remain until today! He devoted himself at an early age to the monastic life, and received further theological training in the Benedictine monastery, not far from Winchester, England. He taught in the abbey school and at the age of 30 became a Priest. After his martyrdom he was quickly hailed as a saint in Germany and England, and his following is still strong today. Boniface is celebrated today, as a missionary, a unifier of Europe, and as German national figure. While it is not officially propagated as such, many believe he is the helper of drivers, and in helping one to find a parking spot. Many call upon him to help them before a trip. Parishes in the United States that are named after this saint, rank among the top 10 parishes in namesake. After all these years, St. Boniface is still very popular. You don’t have to look too far to find a parish named after him. St. Boniface was a “uniter” and an educator. He fits well in our world today as a prominent Saint, that we can all call upon, especially on campuses! He, being a teacher at the Abbey in Winchester, prior to being Ordained a Priest – can help all of us today, especially when our work load at school gets too heavy. Call upon St. Boniface, and he will give you a hand!